“Of all the many out-there places that I’ve been, India’s remote Zanskar region remains my favorite. More than 20 years ago, when I first saw the beautiful imagery created by Swiss photographer Olivier Follmi (http://www.amazon.com/Where-Heaven-Mountains-Meet-Himalayas/dp/0500019541), I’d dreamed of going. Since then I’ve been lucky enough to visit Ladakh and Zanskar three times. Twice while working with the dZi Foundation and once hiking the frozen Zanskar River in winter. Recently, my frequent collaboration with climber/eye-surgeon Dr. Geoff Tabin of The Himalayan Cataract Project (http://www.cureblindness.org/) has created another opportunity of a lifetime. At my urging an eye-surgery camp will take place in Leh, the capitol of Ladakh toward the last weeks of August, 2011. The HCP foundation is sending me on assignment to assist and photograph at the camp followed by a meeting between the doctors and His Holiness the 14th Dalai Lama. This is perfect timing to do one of the treks that I’ve been waiting to do for those 20 years—cross Zanskar. So, I’m inviting you, family and friends, to join me this summer in one of the classic treks of the Himalaya and of the world. Although Leslie wasn’t able to go and the surgery camp was cancelled for political reasons, Kvale went on the trek with some friends and family anyway. 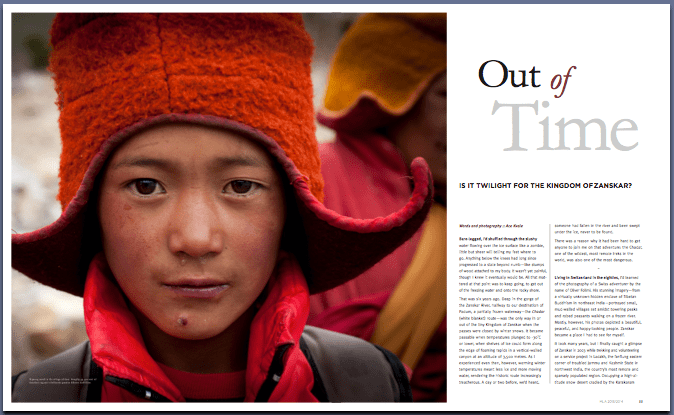 With opportunities to experience Zanskar the way it is becoming rarer every year, Anthony encouraged Kvale to write a more general story about his experiences in the region. The result is this beautiful article about a culture that is vanishing before it has even been found.